The Page is under construction and writting editation text of legal database registration. Please wait until page is edited. Until time when page is edited, please use reserve documents for economic trust, and contact the Representative of Government before You start Action. Multi Economic Property, Development Project, Author Right, Investment Property, Right of Business Action or Mandate. 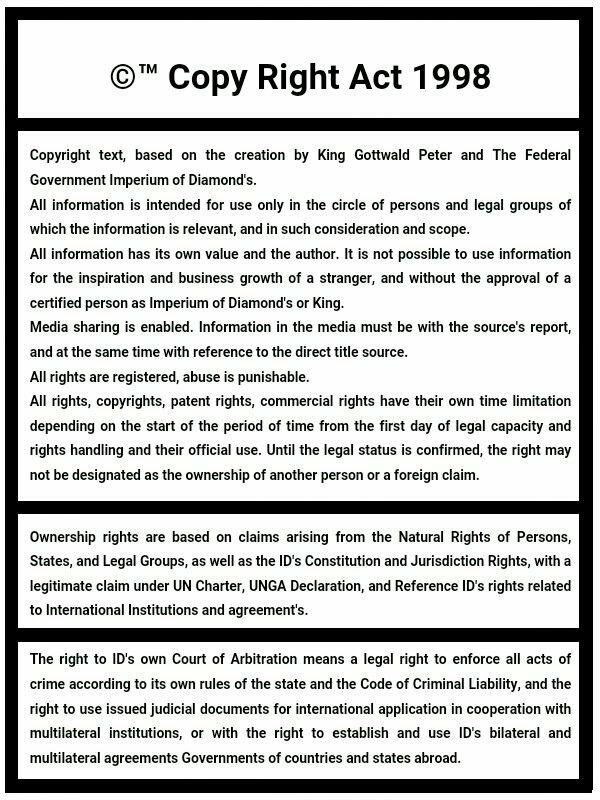 Provisory Office Administration for registration of Legal Economic Property of Imperium of Diamond's government, Legal Institution. Identification: Hover-Craft Industry and Routes, Airport's and Airplan Industry, Car Factories and Car Routes, Air-Lev Train Factories and Railway's, Orbital Elevator and Industry, Space Transportation Industries. Inter-city transport's, 10,000,000 people, Air-Lev Tram's, Levitation Bus, Underground, Industrial Transport Network. Center's for chemical waste storage, reproduce energies or industrially use. Toxic Waste Storage Warehouse. Building source: International Public Market's, and Inter-State Industrial growth. Identification: Underground mines of water from Earth soil source, and air connection between Center's in International Water's.